In 1978 Town Square in Schaumburg was an L-shaped group of single story, dark brown buildings with a pond centered on the property, complete with a small petting zoo of farm animals. As a way to draw more attention to the shopping center, the stores of the complex, led by Cliff Skarr of Town Square Pharmacy, made the decision to start a Farmer’s Market. 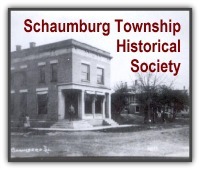 He talked to the newly formed Olde Schaumburg Centre Commission who began working on the proposal. At the time “outdoor peddling” was not allowed in Schaumburg so it took a while to break through the red tape. The market changed its day of the week to Monday in 1981 and, in 1982, changed it again to Friday where it has stayed. Town Square was its home through 1991 when the shopping center started to show too much wear and tear. 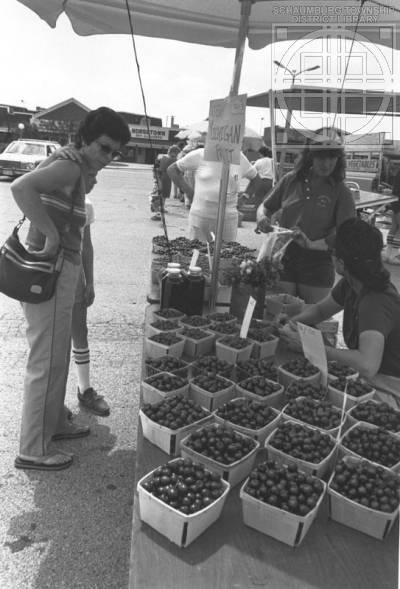 The following year, in 1992, the market found a new home on the grounds of the Schaumburg Transportation Company on Roselle Road. This was the name of District 54’s bus company. 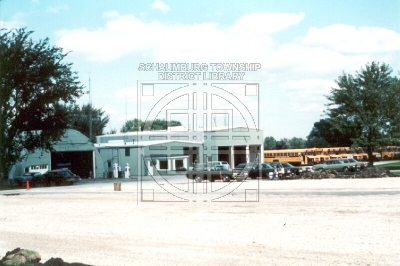 Its offices and bus lot were next to the Schaumburg Lanes bowling alley on a 15 acre lot. For three years, the market could be found in this location. Around 1994/1995 developer, Thomas L. Rayburn, bought the property for a townhouse development called Olde Schaumburg and it became clear the days on the Transportation Company’s parking lot were numbered. The Lutheran church was the gracious host of the market until 2000 when the redevelopment of Town Square and its great visibility proved to be a powerful motivating influence to move the market back to its original location. Today, the market has around 30 vendors on a weekly basis that gather on the lot . Visitors can find home grown fruits and vegetables, meats, flowers, plants, and gourmet cheeses. The market also features pastries, baked goods, olives, spices, homemade pasta, and knife sharpening services. For eating right on the spot, try some of the freshly squeezed lemonade, kettle corn, and snow cones. 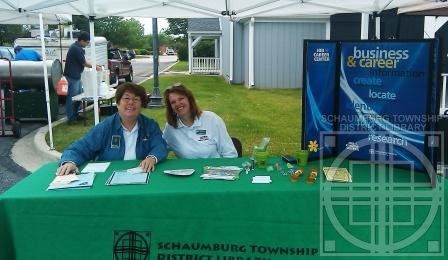 And don’t forget to stop by the Schaumburg Township District Library’s tent! We’d love to talk to you!